There are some people who are suffering from pimples or others from one huge pimple one day. So many people use different types of product to remove the pimples. These days Clinique has launched newest product and its becoming popular. I was also suffering from the pimples that came all at once. But I tried night gel and spot treatment gel. Comparing to other spot products in brands there was an effect. However it is not perfectly done. The size is small and it is not like used as a skin type. In the advertisement it states that it will disappear about 2~3days but for me I used it for a week and it isn’t going away. However compare to the other brands it helps to clam down. But the pimple doesn’t go away. The important point here is that~!!! When you have big size pimple go the dermatologist and get it remove professionally. When you squeeze out with your nails it might destroy the tissue around the place and turn the skin into dull color. In order to fix this problem you need more money than to remove pimples. So be careful when you are squeezing out the pimples. So when you are going for this product don't expect for the pimples to get removed. However it might work for person that matches the product. But I don't recommend to people who have severe pimples. For the people who suffers from a pimple that has formed like a bump and you want it to calm down than use this product. This is a product that relive the marks but doesn’t make the pimples go away. 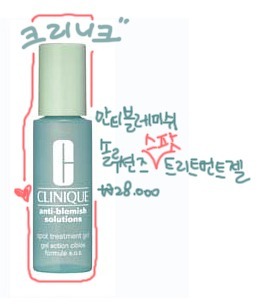 If you have troubles with pimples use Clinique anti blemish solution spot treatment gel. Do not only focus on the cosmetics but try to fix the bad habit. When you take care of your diet there are some people who sees the effect. You have to eat and sleep well. It is difficult not to get stress but, if you do, do something that releases your stress. Also give attention while washing your face and keeping your hands clean.